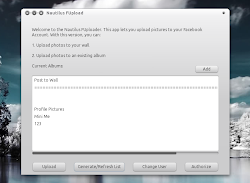 Nautilus Facebook Uploader is an application to upload pictures (it supports multiple pictures at once) to Facebook via Nautilus. Using this application, you'll be able to post photos to your wall, upload photos to an existing album or create a new album. Support for setting a profile picture should be coming soon. Download and extract Nautilus Facebook Uploader, then double click the "install.sh" file and select "Run in terminal". The installation script will now move the files to the right folders and install the required dependencies. Once Nautilus Facebook Uploader has been successfully installed, right click an image (or multiple images) and select Scripts > Upload to Facebook. The first time you use the script, you'll have to authorize it - so click the Authorize button. A new tab should open in your default browser redirecting to Facebook (where you must log in if you're not logged in already) and then click the "Allow" button. Then copy/paste the URL from the browser address bar into the Nautilus Facebook Uploader dialog. Now you can click the "Generate/Refresh List" button. The first time you do this, you'll have to enter your username (NOT EMAIL ADDRESS). If you don't know your facebook username, CLICK HERE (see the url under "Your username has been set"). And finally, select where to upload the images (an album or your Wall) and click "Upload" - the images you've previously right clicked will now be uploaded to Facebook. Note: the application works ok for me using Chrome, however the Nautilus Facebook Uploader page mentiones there might be issues when authorizing the application using Firefox. To overcome this, you could set a different browser as default when authentificating Nautilus Facebook Uploader or follow the instructions @ Nautilus Facebook Uploaded Gnome Look page.